A solitary photograph in a 1960's Sulzer publicity brochure followed, several years later, by a chance encounter with some South American locomotive photographs posted to 'alt binaries pictures rail' were the seeds of this bizarre adventure. Bolivia's two 730hp, 6LDA28 powered locomotives were delivered during the early 1950's to handle freight and mineral traffic on the F.C. 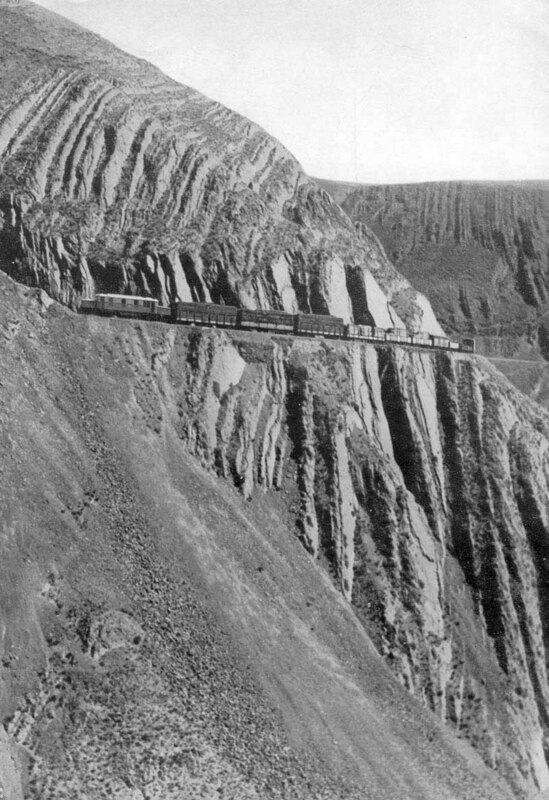 Machacamarca - Uncia line. That they might still exist, fifty years later, perhaps only in a scrap state seemed very remote. But word on the street was that they might still be found as rusting hulks at the Viacha workshops. The intriguing view of one of the Bolivian Sulzers depicted in a publicity shot for a 1960's brochure on the Sulzer 6LDA28 engine. Thus with the seeds sown for a possible adventure it was only a matter of time before those first steps south were taken. A hazy morning at Long Beach airport saw the start of this unusual adventure. Bolivia could be reached with flights from Los Angeles but these required changing in Santiago, Chile, and since my abilities in speaking Spanish were learned from several episodes of 'Fawlty Towers', it was felt wiser to use the daily American Airlines flight from Miami to La Paz. Thus a Boeing Super 80 # N289AA started the journey with the first leg to Dallas. 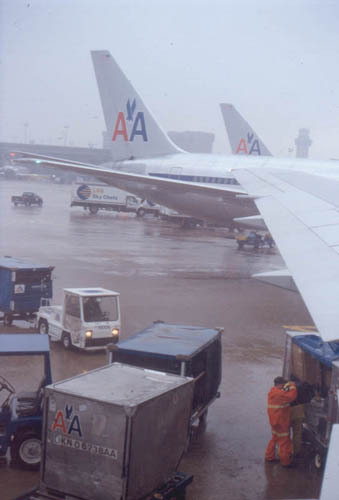 Los Angeles had received no rain since May, apparently it was all falling on Dallas this day, flights were arriving & departing OK but the wild display of lightning kept ground personnel indoors until the storm cells had cleared the airport terminals. These atmospheric theatrics delayed the Dallas - Miami leg of the trip for two hours, once in the air the Boeing 767-300 made short work of the trip to a very toasty Miami. After several false starts we boarded the 767-300 for the short hop across the Gulf of Mexico to Miami. Rain doesn't photograph well, but in this snapshot on the apron at Dallas it was coming down like the proverbial cats & dogs. Much of the lightning which had been bombarding the airport had been vertical, straight to the ground. The airline code for Miami 'MIA' clearly stood for 'missing in action', for those travellers lost in the labyrinth of lengthy passageways that link the numerous terminals at Miami. After about ten minutes of following signs for terminal E, a departure board displaying flights to Rio De Janeiro, Sao Paulo & La Paz confirmed we had reached the right concourse. Departure was just after midnight, slightly late, with a Boeing 757 as our chariot for the six hour flight south across the equator. An intriguing development was the serving of dinner at about 2am. At 33,000' there wasn't too much to see outside, the further south we travelled the fewer the pinpoints of light. However as the journey progressed Mother Nature provided some exciting lightning displays throughout the night on the eastern horizon. After the early morning 'dinner' came a full length feature film, the view outside the window seemed more appealing. As dawn broke the plane started its descent towards La Paz, the snow covered high mountains of the Cordillera Real surrounding La Paz providing a dramatic introduction to Bolivia. El Alto, the airport for La Paz, sits at about 13,000', the one runway seems to go on for ever, but vitally necessary due to the thin atmosphere, the stalling speed for aircraft is much higher here. Landing faster therefore requires that extra length. It was 6am and suddenly we're here and its cold, not much above freezing. Customs & immigration were a formality, followed by a taxi ride into La Paz. This has to be one of the most dramatic taxi ride's anywhere. From the flat, barren 'altiplano' on which sits the airport, past the spreading poverty of El Alto the road drops suddenly to reveal the splendor of La Paz in the valley below. A sight not to be forgotten, especially with the stunning snow capped Nevado Illimani (6,439metres - 21,119 feet) to the south. The road quickly drops 1,000 feet, my destination being the Terminal Terrestre Ciudad de La Paz bus depot which handles most destinations to the south & west. With the help of some strangled Spanish some US dollars are converted into Bolivars and a bus ticket is obtained for the next service to Oruro. In true Bolivian efficiency it is necessary to buy a 'Platform Ticket' (2 Bolivars) to gain access to the bus! Whilst waiting time for the bus to leave it struck me that the bus station bore a remarkable resemblance to a railway station. Which in fact it had been once! It had been designed by Gustaf Eiffel, hence its European feel to it, though the trains had long ago stopped running here. Now it is filled with diesel powered buses from Mercedez Benz, Scania & Volvo, many with some pretty dodgy looking tyres. Departure is about twenty minutes late, reversing the efforts of my earlier taxi ride. The bus settles down to a steady rattle as it climbs back out of the valley and past the airport. A close up early morning view of El Alto is a bit of an eye-opener, a few more passengers are picked up before we head south on a tarmacd highway towards Oruro, a journey of about 130 miles, three to four hours depending on road/weather conditions. The first sign of a railway is seen at a crossing of the highway by the defunct (?) La Paz - Viacha branch line. Although we're on a two lane road, most traffic hugs the centre line, avoiding the potholes and many, many repairs being undertaken. Bolivia is the second poorest nation in South America, the majority of its roads are un-surfaced. About an hour out of La Paz the road repairs cease and we are able to make better time, especially as the road seems to be continually on a falling grade. From time to time on the west side of the highway the Viacha - Oruro railway line comes into view. For those not interested in the scenery a movie is being shown on the bus, 'Black Dog' (with Patrick Swayze & Mr Meat Loaf) - dubbed in Spanish, and seemingly uncut. By about 11.30am the metropolis of Oruro is reached, and clearly now I begin to wonder what I'm doing here! After negotiating much of downtown Oruro we are surprisingly driven past the railway workshops, which reveal an eclectic mix of rolling stock including several forlorn looking steam locomotives. Today's journey ends at the Terminal de Omnibuses at Park Hernando Siles under the Hotel International, the entrance of which I cannot find so the Hotel Bernal on the corner of the square is chosen for a couple of nights. At 60 Bolivars per night (about US$9), with a corner room overlooking the square, all seems well, after three planes, four airports, two continents, a taxi and a bus, well its time to put our feet up. The hotel manager recommends two nearby food emporiums, so we venture into the delights of Bolivian cooking. Beef and chicken with vegetables seem to be the staple here, though the sausages are rather spicy, rabbit is also quite popular. Oruro is also well known for its speciality - sheep's head!. Revictualled we head off into Oruro looking for who knows what. The single track narrow gauge line is found running down the center of one of the main thoroughfares, Av 6 de Agosto. It being a Saturday the market traders have set up their stalls on both sides of the street and all over the track that run down the center! Clearly nothing will use the line in daylight hours today. At the south end of the market the railway station is found, a fine piece of modern day architecture topped off with a dramatic blue painted corrugated iron roof. A clear and concise timetable posted by the entrance reveals the 'Expreso Del Sur' will provide the next part of my journey. But it leaves on Monday afternoon, allowing plenty of time to investigate the cultural wonders of Oruro. Even the delights of Bolivian cable TV and a boisterous electrical storm nearby doesn't stop sleep coming swiftly this night. October is springtime in Bolivia, the winter chills are easing and the rainy season, due in November has not arrived yet, this Sunday dawns bright and clear, temperatures are not much above freezing at dawn, but by mid-afternoon it will be a toasty 70F. Sightseeing, such as it is in Oruro, is the order of the day. The street market had got bigger, seemingly one could obtain almost anything here, from eggs to cement mixers, you only had to ask. A circumnavigation of the railway workshops, located at the corner of Av 6 de Agosto & Av Villaroel was made, like the majority of railway facilities in Bolivia it was well secured and patrolled by armed members of the local police force. Whilst 'sightseeing' a chance encounter occurred with two FCA diesels arriving from the north. The two were split here, one went off in the direction of the station whilst 968 took the line into the works yard. Your photographer is standing on the mainline, which at this point ran alongside a well travelled street so speeds along this section of track are very low. This was the only rail entrance to the works area, normally barred by a sturdy iron gate. Almost gone, 968 disappears into the yard. The second locomotive, 1014, heads off southbound along the mainline towards the station. Street running was limited to about 5mph. Behind the locomotive are the railway workshops. Monday dawned bright and sunny, the station ticket office opened at 8am, so an early visit was made to obtain our ticket to Uyuni. The 'Expreso Del Sur' carried three classes, the 'Executivo' class was already fully booked so a ticket for the 'Premier' class was obtained, 55 Bolivars (US$8). 1023 heads towards the station along Av 6 de Agosto. For the true enthusiast the recommended Hotels' Lipton & Monarca can be found on this street, with rooms overlooking the track. A view midway down Av 6 de Agosto, the narrow gauge railway tracks take center stage here. Although all Bolivia's rail lines are narrow gauge, the trains still appear impressive against the regular street traffic. At its southern end Av 6 de Agosto terminates at Calle Bolivar and the street running ends. This is also the location of one of Oruro's big street markets (Mercado Campero), which are particularly active on Saturday & Sunday. The stall holders will frequently set up across the tracks, quickly moving the stall & merchandise when the occasional train passes through! The white/orange minivan - center right - is typical of the 'trufis' plying the streets on dedicated 'bus routes'. There is usually someone hanging out the door yelling the number and route of the minivan. On Saturday & Sunday the market is at its busiest and most extensive. Presumably this is when the least trains run, no passenger trains use this piece of track, although movements between the Workshops and the station area seem to be frequent. With Oruro station yard close by this piece of track is well used by shunting/switching moves, much to the annoyance of the stall holders, pedestrians and the many bus routes. Another type of bus is featured, the blue Ford on the right, known as 'micros' these are cheaper than the 'trufis' but don't travel so many routes, considering the apparent general dilapidated condition of most of them it is surprising that they make it through the day without conking out. After checking out of the hotel and walking back towards the railway line some light engines were noted near the workshops. One however doesn't hurry in this part of Bolivia, the high altitude (Oruro's elevation is 3,702m) will quickly cause shortness of breath, 'slow and easy does it' is the way to go. Chasing trains on foot here requires a gentle stroll! Several views were obtained of these fine looking machines, a return to the station revealed more activity, pretty much the rest of this day was spent watching the activity here, a convenient footbridge at the south end of Av 6 de Agosto providing some fine views. As departure time approached - 3.30pm, the station became a hive of activity, of locals taking advantage of the few timetabled services, though possibly outnumbered by the tourist contingent, mostly headed for Uyuni and the spectacular salt flats and other related geographical features of the region. The rolling stock, with its single blue and yellow diesel locomotive arrived about thirty minutes prior to departure time. All seating is assigned, seat 19 in coach 1558 was my home for the next six hours or so. Coach 1558 was a product of Fiat. The 'Expreso Del Sur' operates twice weekly between Oruro and Villazon on the Argentine border, like a lot of travel in Bolivia, the longer distance services generally operate at night. With departure time drawing near the station staff have finished unloading the orange boxcar, all by hand, there was no forklift and nothing was palletised. The station sign reads 'Elevation 3706m' (12,155 feet if my calculation is correct). Despite normally living near sea-level the altitude gave no problems, on return to Los Angeles it took about three days to become accustomed to the 'heavy' air! Afine study of 1008 as it shuffles around the yard. In the background is Oruro station with its unmistakable vivid blue corrugated iron roof! More activity in the yard, closest to the camera is 1014 whilst 1023 is in the left background. Both carry different styles of the blue/yellow livery. The 'Expreso Del Sur', my first Bolivian train ride, runs two times a week between Oruro and the Argentine border at Villazon. Today it has six coaches and a box car, mine is the first coach after the box car. More activity in the yard. The two diesels sport slightly different paint schemes. A fine looking view of 1014 at Oruro station. Clearly revealed is the BoBoBo arrangement of the bogies/trucks, separated by the twin fuel tanks. Departure was on time, with a slow exit from Oruro, past a great deal of modest housing and run down businesses. For much of the journey the line followed the edge of the great salt flats, the country was generally undulating, though the extreme altitude no doubt added to the labours of the locomotive. For a while a metalled road paralleled us, but after about sixty miles it turned to a dirt track, surprisingly used by an overnight bus service between Oruro & Uyuni. The nine hour journey is only possible if it doesn't rain, then the road becomes impassable. The view from the window changed little, on the east side were the mountains, on the west side were the unfolding vistas of the salt playas and volcanic outcroppings. Every so often, in the middle of nowhere one would encounter a local Indian woman with a flock of sheep, perhaps with a few donkeys and llamas. Around the shallow lakes were huge flocks of flamingos. Occasionally a passing loop would be encountered and from time to time strings of wagons were parked in remote sidings, usually awaiting loading with mineral ores of some sort. Many closed stations were passed, all still proudly showing their nameboards. We stopped at one, our coach had developed a noisy roof ventilator, the on-board fitter could not solve the problem from inside the coach, armed with a milk crate and a screwdriver we were not in the least bit surprised. Once stopped he was quickly on the roof with the coach conductor sorting out this noisy fan. After a short while the inevitable movies were shown, this time it was the delights of 'The Mission' & 'The Specialist', the steamy parts of the latter movie involving Mr Stallone & Ms Stone were fast forwarded by the conductor. Despite the relatively modern rolling stock being used it quickly became apparent that the local red dust from the salt playas found its way into every nook and cranny in the train, the window ledges were caked in the stuff. As the evening wore on three things happened, the sunset provided an amazing display of colours and shadows, a short while later a full moon rose in the east spreading a yellowy light on this rather barren landscape. Thirdly I became increasingly aware that my seat was most uncomfortable and despite the ample leg room it was difficult to find a comfortable position. Our arrival at Uyuni close to time at about 9.30pm brought relief to my aching back. Fortunately it was dark so the grim reality of Uyuni was hidden until the next morning. The Hotel Avenida, across the street from the station (well in Uyuni everything is across the street from the station) provided a basic room for 40 Bolivars. It had indoor plumbing and a TV with two channels, the one that came in clearest was showing 'Out of Africa', dubbed in Spanish of course. After the adventures of this day, including a good dose of sunburn, sleep came quickly. There is not a lot in Uyuni, it is the starting point for four wheel drive tours to the Salar de Uyuni, one of the world's largest salt playas, featuring many strange and wonderful geological features. The guide book states the Uyuni is 'climacticly challenged', to visit here for any other reason can only draw doubts about one's sanity. But there is another draw for the tourist here, just. It can be found three kilometres south of the station (the guide book said one kilometre!). The former operator of the Bolivian Railway network has cleverly abandoned about a dozen steam locomotives, and other assorted railway junk, at the junction of the lines to Argentina & Chile. But first a visit was paid to a steam locomotive displayed a short distance north of the station in the middle of Av Ferroviaria. If the builders plate is correct it is Hunslet 1103-1912, when it was last used I have no idea. We returned to the station to obtain a ticket for the return to Oruro. Fortunately the imminent departure of the railcar to Potosi meant that the ticket window was manned. A 1967 Ferrostaal (Essen, Germany) built railcar, number 337 was scheduled to work the 10am Uyuni - Potosi service. At this point in time it had one passenger. With the ticketing formalities completed the trek was commenced to the steam graveyard, the walk was warm and dusty, the prevailing winds had blown every piece of rubbish possible towards my destination. Not helping the matter was a particularly thorny little pale green bush that populated the area, it grabbed hold of every loose piece of plastic and paper, turning itself into a grotesque rubbish plant. Sitting happily north of the station on Av Ferroviaria is a Hunslet steam locomotive, looking remarkably sharp in the crisp morning sunshine. In travelling through a number of Bolivia's cities it is interesting to note that the median strips are kept well groomed. On a number of occasions workers were carefully tending to the plants, all carefully protected by miles of ornamental iron railings. That some of the streets contained potholes capable of swallowing whole cars seemed to go un-noticed. Sure enough after a hard slog the scrapyard was reached and still present were about a dozen steam locomotives in various states of serious decay. Locomotives from the workshops of Beyer Garrett, Baldwin and North British stood defiant in the dusty Bolivian landscape. The yard also contained many wagons and some seriously deformed coaches. The scrapman seemed to have randomly attacked things, cab parts were strewn about, far removed from the locomotives they were once fitted to. The distinctive water tanks carried by the Beyer Garretts were tossed around like cardboard boxes. It appears that the rail connection to the yard has now been removed. Whilst taking a siesta prior to walking back to town a number of German tourist stopped by, despite its remote location the scrapyard is well visited. The trek back to town was taken at a leisurely pace, my train wasn't due to arrive until midnight, and we had just covered the one tourist attraction in town. The town square provided a tree shaded place to while away the hours. I was not alone, those adventurers taking the four wheel drive tours often faced long delays whilst empty seats waited to be filled. Fortunately the day was sunny and mild, Uyuni is infamous throughout Bolivia for its challenging climate, particularly cold in winter. But now spring was almost here and the rainy season had not yet started. With a good book to read and a bible study to complete the clock ticked onward. Lunch was of course pizza, Uyuni is famous for its plethora of restaurants serving pizza, presumably an offshoot of the tourist trade. Mine was an Hawaiian pizza and a large bottle of Coke. Coke must be the most advertised thing in Bolivia, no matter where you turn, its always much better with Coke! A distant air horn suggested a visit to the station to see what was up. Sure enough an FCA diesel was marshalling a freight train at the west end of the yard. The locomotive paid a brief visit to the station to have its radiators topped up. Whilst taking a couple of photographs the station policeman paid a visit! After a couple of broken phrases in English & Spanish I whipped out my phrase book to see if we could make sense of the situation. The policeman took hold of the phrase book and started to thumb through it, and to my surprise started to sound out many of the phrases in English, well sort of. For the next hour an English/Spanish lesson took place on the platform at Uyuni. One piece of information gleaned from this exchange was that there were a number of steam locomotives in the yard opposite Uyuni station, hidden amongst all the freight cars. The 10am departure from Uyuni to Potosi is by railcar, the train will follow the mainline northwards towards Oruro before taking the Potosi line at Rio Mulatos. Uyuni's population is mostly employed by government agencies, tourism & mining. The latter is still important, principally in salt extraction, and as a reflection of the impact of mining on the area the City has 'preserved' this Hunslet on a substantial plinth just north of the station. The number 551 is carried on the buffer beam, the builder's plate reads Hunslet 1103-1912. During the afternoon all was quiet in downtown Uyuni, apart from the music coming from one restaurant, their music collection seemed to be entirely Pink Floyd. However an air horn sounded at the station, it belonged to 1008 doing some shunting in the yard north of the station. After a bit of shunting the locomotive pulled up to the station and made use of the water supply to top up its radiators. After that it disappeared up to the north end of the yard, still being there when my train finally pulled out around midnight. In the maze of tracks behind the locomotive were a number of steam locomotives. The evening was spent at the station, mercifully the returning service from Villazon was on time, my ticket was for the same coach, this time it was seat number 13, again a window seat. With departure just after midnight and six hours or so to Oruro, it was time for a bit of shut-eye, the conductor obligingly dimming the coach lights. Despite the none too comfortable seat sleep came easily after such a long day. Oruro was reached on time, another sunny, clear day on the altiplano. A brisk walk to the bus terminal was followed by the rapid purchase of a bus ticket to La Paz. Four hours later we were at La Paz, after several tries at getting a hotel room the Hotel Oruro (what else! ), on the Plaza Alonzo de Mendoza, provided a reasonable room on its fourth floor, with a grand south facing view overlooking downtown La Paz. The afternoon was spent sightseeing, and checking out the Burger King fast food restaurant. During the afternoon it rained, as it always seemed to do. The early morning mists soon burned off leaving a bright blue sky over La Paz. We wandered up to the bus station to find a bus to Viacha, apparently there weren't any. You had to take trufi to El Alto and then change there into a trufi to Viacha. So the easier option was taken, a radio taxi for the grand sum of 60 Bolivars. The exchange between my driver and his dispatcher concerning 'el turisto' going to Viacha brought some chuckles over the radio! So off we went, back past the airport, in view were a number of aging and partially dismantled DC3's. Downtown El Alto was truly a revelation, quickly left behind as our road paralleled the railway line to Viacha. Arriving in the town square, with no sign of the locomotive workshops a couple of school boys pointed us in a southerly direction. Negotiating the cobbled, pothole ridden backstreets off Viacha we somehow ended up outside the army barracks. The soldiers were better able to direct us and within minutes having negotiated some fine looking cart tracks we arrived at the workshops. As usual the workshops were guarded, this time by two armed policeman. As expected without the necessary authorisation access was denied, the policeman informing me that the 'Director' who could make the authorisation was not at the workshops today! However my taxi driver, Gregorio, and the two policeman seemed disappointed (clearly more than I was), and with the help of the taxi company's English speaking dispatcher, they endeavoured to contact the FCA offices in La Paz. As usual bureacracy and paper work got in the way, so it was left for Gregorio to return me to the delights of La Paz. Whether the workshops did hold the carcasses of those early Sulzers would remain a mystery to me for a little while longer. Back in La Paz it was time for lunch, we broke down and tried the MacDonalds, the burger was good and there was ice in the drink! If you ask them nicely they'll let you tour their food preparation area! We hurried back to the hotel to avoid the mid-afternoon downpour. Out of the blue a phone call came through from Rosemary, the taxi company dispatcher, she had been working with the FCA office, and said we should go visit the FCA offices in downtown La Paz. A shortwhile later Gregorio and Rosemary turned up to whisk me off to the FCA offices. These were lower down in the 'well-to-do' part of La Paz. The offices appeared to be in a well maintained two storey Victorian era house. After presenting our written request it was a case of hurry up and wait. The answer came about an hour later, in the negative. Although it was all in Spanish it sounded like an answer right out of the company's rules & regulations book. The long suffering Gregorio returned me to my hotel, not an easy task in the evening 'rush hour' and in the midst of a particularly intense rainstorm. I thanked them profusely, grateful for their kindness and their interest in an Englishman's wild goose chase. My last day in La Paz was another one of exploration. My map showed the there used to be a railway station in the upper part of the city. This required a stiff climb, not too much of a problem in the cool morning air. The station looked like something right out of the Beeching era, a recent rain shower gave the impression the building was very much still in use. The clock was still showing right time, and the initials of its former owner, E.N.F.E. were still emblaisoned on the front. But it was all locked up and fenced off, the platforms were overgrown, though the rails were still in place. 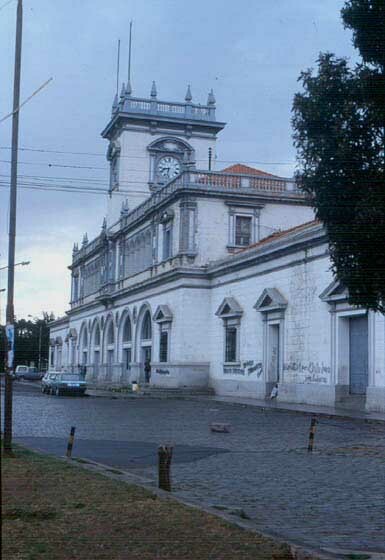 The ornate cast iron awnings still spanned the platforms, the apparent lack of a metal recycling industry in Bolivia having prevented there destruction. Interestingly some fine old views of La Paz on the walls of the MacDonald's restaurant included a view of the station area taken from an elevated position. It revealed tracks leaving only from the southern end of the station. The clock still keeps time, the rain is still falling, but there are no trains for this grand old station. A circumnavigation of the station, more steep narrow streets, revealed that the bridge at the south end of the station had been removed and much of the west side of the station yard was now occupied by a trucking and bus company (sounds familiar). Closer investigation revealed the presence of some railway 'workshops', present were some very rusty looking coaches. With no good news here it was back down the hill for more exploration. This day the afternoon rain was delayed, it came about tea-time and with a vengeance. As well as very heavy rain there was a fine lightning show, made more interesting because of the lightning occurring lower down in the valley, somewhat below us. The rain continued long in to the night, it was still coming down hard when I made my last taxi trip, to the airport. The American Airlines flight was due to leave about 7am, one was supposed to be at the airport by at least 4.30am, which meant a very early departure from the hotel or roughing it at the airport for the night, either way one wouldn't get much sleep. Unbeknown to me the lack of flights between about 11pm and 6am allowed for the complete shutdown of the airport, lights out, doors locked including the entrance gates to the whole facility. A sweep by the security personnel revealed a number of travellers booked on early flights with the same idea as me! With identity established the security guy wished us a quiet night, not an easy thing with the storm continuing to rage outside. Despite the rather firm seats and the cooling temperatures we dozed off from time to time, finally awakened by personnel opening up the airport for the new day. The American Airlines flight from Miami spends about an hour at La Paz, does the short hop to Santa Cruz, spends about an hour there before heading north to Miami. Ticketing, customs & immigration proceeded swiftly, the Boeing 757 was on time, boarding was swift, we were soon accelerating down that long runway and into the thin air. As luck would have it as we turned east we flew right over Viacha, the railway workshops clearly visible alongside the very obvious railway lines. The short hop over the snow-capped Cordillera Oriental took us into a completely different part of Bolivia. Looking more like Hampshire than Bolivia we touched down at Santa Cruz, seemingly a world away from La Paz and the altiplano. With an exchange of passengers, a check of all cabin baggage and refuelling of the plane we were slightly late in departing northwards for our trek across the Amazon Basin at 37,000'. Fine weather allowed for a grand South American geography lesson. Some magnificent thunderheads, towering masses of white caused occasional turbulence. Crossing the coast near..... we headed north over Jamaica & Cuba, the multi-hued blue waters of the Carribean swiftly disappearing underneath us. 1 1 Hunslet 1904 / 39 0-6-0 Diesel Mechanical 252hp. A quantity (5?) of the 1978 order of Hitachi's were transferred to the FC Oriental. In 1996 the ENFE locomotive fleet in the west was leased to the FC Andina. The active locomotives comprised members of the 841, 951 & 1001 Hitachi series of locomotives from 1968/78 and the 980 series SLM/BBC locomotives from 1985. Not every example of this fleet was operational. For views of the Uyuni scrapyard click here. For more on the Sulzers in Bolivia click here. All errors & omissions are mine alone. All information accurate as at October 2002. Approxiamate exchange rate was US$1 = 7 Bolivars. Several passengers watch 953 marshal some freight wagons at Oruro station. FCA 962 manouevres at the south end of Oruro station. As with most large stations on the Bolivian system the entrance/exits to the stations are securely gated, the gates only being opened when trains arrive or depart. FCA railcar 337 working a La Paz - Oruro service with six passengers & three crew. 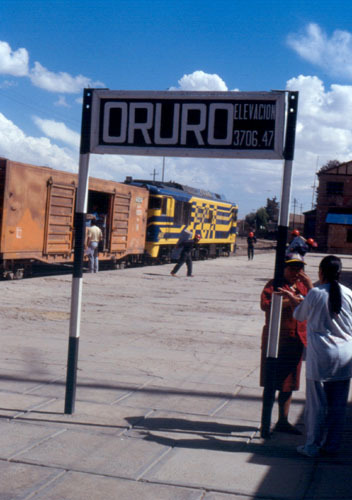 The railcar is stopped just outside of Oruro whilst the crew inspect something. Fare for the trip was 20 Bolivanos and took about four hours, which was comparable with the bus service, although the bus service was more frequent and heavily used. 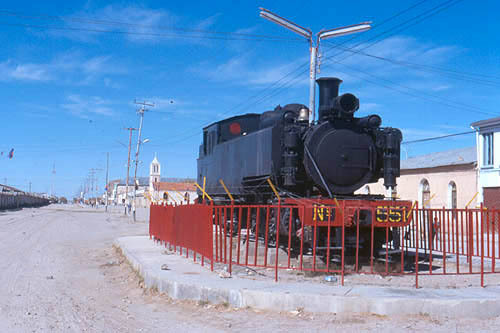 Although Uyuni is best associated with abandoned steam locomotives in Bolivia, a number of other locations still hold steam locomotives in various states of disrepair. This view is at Potosi. Whilst taking these views the photographer was shepherded to the Station Master's office for an explanation of what they were doing. All was well once it was confirmed that the views would not be used to belittle Bolivia or be used as negative propoganda. The views below are courtesy of John Middleton who visited the 'altiplano' region of Bolivia during March & April 2008. A fine portrait of 1008 at Uyuni shed during March/April 2008. The locomotive had just worked the 'International Mixed' from Chile. In contrast to the views of 1008 above, the locomotive has gained the blue light on the cab roof and the jumber cables on the cab front. Another fine view of 1008 showing the intricate blue & yellow livery and the unusual arrangement of the three bogies. On the leading cab the jumper cable is missing. When the weather is fine the intense blue sky lets you know that your at a high altitude, and watch out for the sunburn! A detailed view of the front of 1008 at Uyuni. A pair of the Hitachi locomotives wait for their next turn of duty in Uyuni shed sometine during March/April 2008. 1008 again, now seen at Poopo (a short distance south of Machacamarca) with a lengthy northbound Uyuni - Oruro freight. The scenery is so typical of the southern altiplano, topped off by that big blue sky. The security compound at Machacamarca holds 1020 and the Expresso Del Sud trainset. 1020 carries the simplied blue & yellow striped livery, less stripes than the earlier livery and a much more simplified FCA logo on the cabside rather than on the side of the locomotive. An Oruro - Uyuni freight passes through typical altiplano landscape - a transition between the mountainous east side of the region in contrast to the Salar de Uyuni on the west side of the line. 1022 stands in the yard at Viacha during March/April 2008. An FC Oriental Hitachi-Mitsubishi locomotive sits in Viacha Workshops during March/April 2008. Last updated October 28th 2011.